Biscuits are demanded by almost all the sections of the population from a child to senior citizens, thus accounting to an inevitable demand. The growth of tourism in the Middle East owing to Mega events in UAE and Qatar, rising population and changing lifestyle would contribute to the Middle East biscuit market forecast revenues over the coming years. According to 6Wresearch, Middle East Biscuit market size is projected to grow at a CAGR of 3.0% in revenue terms during 2017-23. Biscuit market is anticipated to register modest growth during the forecast period owing to growth in retail sector and increasing young age population in the region. Also, new product development in sweet and savory & crackers segments would further surge the Middle East biscuit market share in the coming years. Modern lifestyle has changed the shopping style of people. Super/hyper markets are the key distribution channels for biscuits in countries such as Saudi Arabia, UAE and Kuwait. However, convenience stores are still the major distribution channel in Jordan and Lebanon. Some of the key players in Middle East biscuit market include Mondelez, Britannia, Ulker, United Biscuits, IFFCO, Loacker, NBCC and United Food Industries Corporation Ltd. (Deemah). The Middle East biscuit market report thoroughly covers the Middle East biscuit market by categories, distribution channels and packaging. The Middle East biscuit market outlook report provides an unbiased and detailed analysis of the on-going Middle East biscuit market trends, opportunities high growth areas, market drivers which would help stakeholders to device and align their market strategies according to the current and future market dynamics. and Volume for the Period 2014-2016. Revenues and Volume until 2023.
by Category for the Period 2014-2016. Revenues by Category until 2023.
by Distribution Channel for the Period 2014-2016. Revenues by Distribution Channel until 2023.
by Packaging for the Period 2014-2016. Revenues by Packaging until 2023. • Middle East Biscuit Market Trends and Developments. 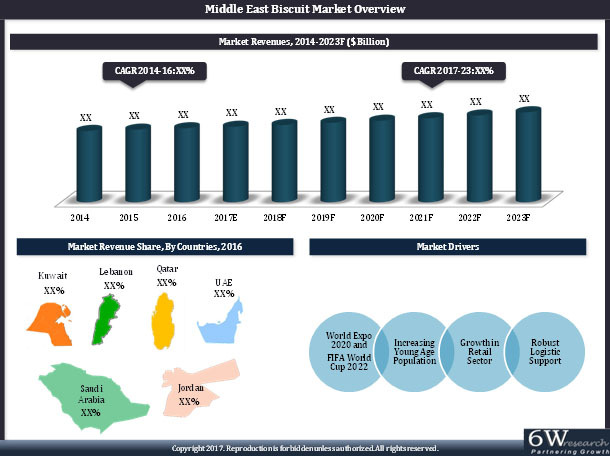 • Middle East Biscuit Market Overview on Competitive Landscape. 38.5. National Biscuits Confectionery Co. Ltd.
38.6. Parle Products Pvt. Ltd.